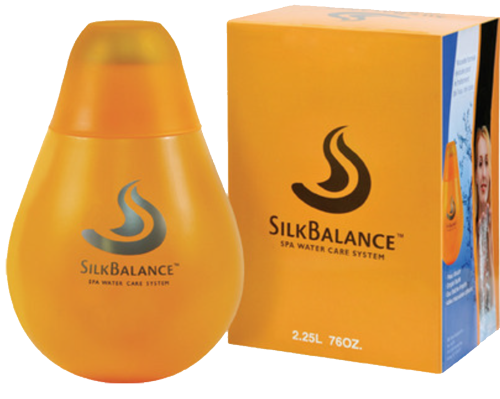 Welcome to SilkBalance™ For Spas! A Relaxing Silky Soft Water Spa Experience. Softens and Conditions Your Skin. • be safer for the environment. • prevent dangerous bacteria build up. SilkBalance™ has a revolutionary water care formula that will finally allow you to continuously enjoy a crystal clear water experience, without any detectable odors or allergens. This fresh and pure water feeling will leave your skin feeling soft and silky, enhanced by our unique formula ingredients. Gone are the test strips, balance kits, alkaline increasers, calcium hardeners, Ph increaser or degreaser, stain & and scale controllers, “Throw all those chemicals away” SilkBalance™ eliminates all the time and frustration with your current water care maintenance program, no more inventorying and buying all those chemical products. Just one application per week! Our special formulation makes it so simple. “Shake & Pour” it once a week for luxurious and soothing fresh water experience. Your spa and your time is about relaxation, not frustration.